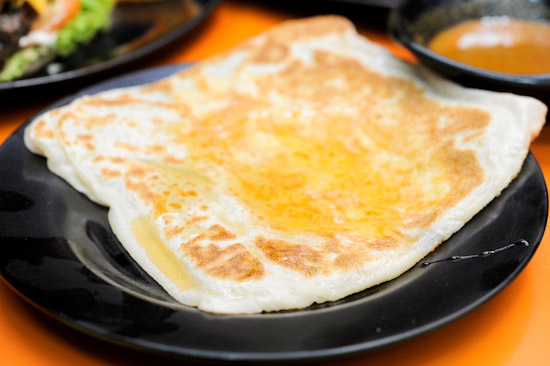 When it comes to having supper in Singapore, Simpang Bedok – a stretch of halal eateries that open till late – immediately comes to mind. Among them, Spize Supper Club is one of the most famous muslim restaurants serving halal food. Besides Simpang Bedok, it also has another branch at River Valley that caters to the hungry late night club goers. If you ever find yourself hungry in the middle of the night, Spize halal restaurant at Simpang Bedok is probably your best bet. It has a very comprehensive menu. 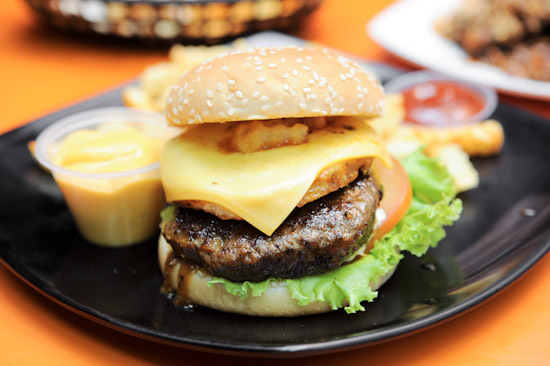 From Thai food like Pineapple rice ($9) and Tom Yam Seafood ($10); to Malay food like Mee Goreng ($5.5) and Nasi Ayam ($3.8); and Western food like burgers ($6.5) and steak ($14.9) – there is something for everyone to choose from. We started with the Spize Burger ($7.5) – chargrilled beef patty with sunny side up, BBQ sauce and cheese. 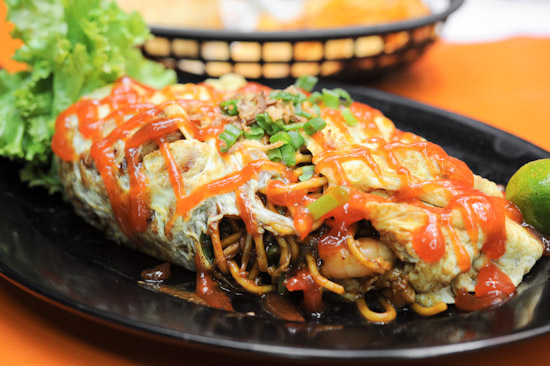 The Mee Goreng ($5.5) came wrapped in an egg omelette. Both dishes were just fine – I mean, how badly could anyone make a burger and fried noodles? 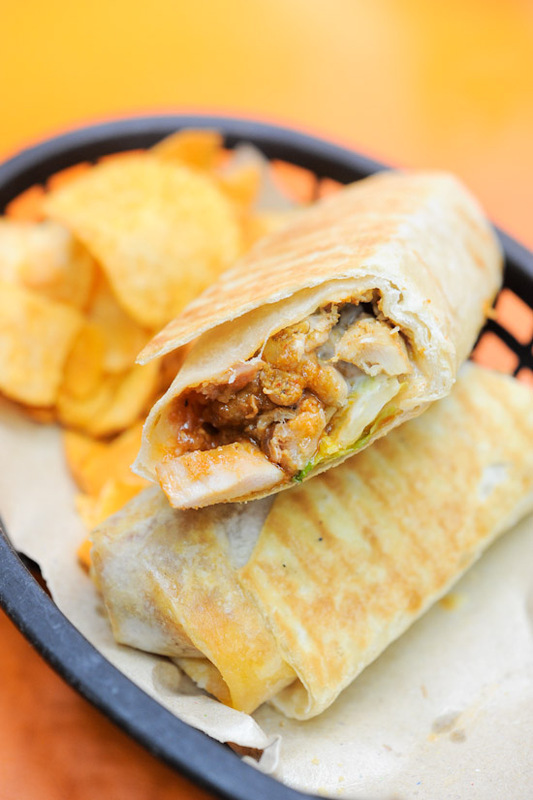 My friend was raving about Spize’s Chicken Wrap ($5.5), so we ordered one to share. I definitely wasn’t expecting it to be rock-my-socks-off-good. What makes Spize Supper Club so popular? I think it is a combination of cheap food, late night hours, and the atmosphere of eating by the road side. It is one of those places that you come back again and again for late night supper. I am on a mission to try more Muslim food, so do leave a comment and let me know where are some of your favourite halal restaurants in Singapore. You can try Segar restaurant near Bedok interchange, Kampong chai cher seafood, habibie at tampines, maboob rojak at tampies S11! The wrap looks good! What’s inside? Is it oily? hajah maimunah at jalan pisang brad! awesome nasi padang. affordable unlike the one at zion. You can’t go wrong with places around the Arab Street/Haji Lane area. Personally I love Fika for their Swedish hash and Amirah’s Grill for their Middle Eastern fare! Try halal Vietnamese cuisine over at Orange Lantern. Their imperial rolls are delish and they serve a pretty decent bowl of pho too! not sure if you have but if you havent, you must try chako (authentic homemade japanese food by a japanese lady who married a malay man) and yes the food is totally halal! its located at hong leong gardens. Enak Enak at East Coast Park is also a good place for supper! They have a variety of yummy food and drink! They are all halal too! please do try there!